Above is the Death Certificate of Christiana Musgrove, mother of George Musgrove's first wife. She died aged 36 of Consumption (TB) at 5 Princes Street St Pancras. Note that her husband Thomas who had previously been shown on official documents as an artist/colourman is now shown as a gentleman. This may indicate the source of the money that our George acquired in about 1871. So far we have been unable to trace any information on Thomas Musgrove after this date. After extensive searching of Burial Records we have been able to trace her grave and place of burial. Her daughter Elizabeth who died in 1850 was buried in the Old St Pancras cemetery, so one would have thought that her mother would have been buried at the same place. This was however not the case. The old St Pancras Cemetery was at this time due to close, all future burials were to be made in the new replacement cemetery near Finchley. Christiana Musgrove was buried on June 25th 1851 eight days after she died. She was buried in the cemetery of the Parish Church of St Martins in the Fields, which at this time was accepting burials from neighbouring parishes like St Pancras. The cemetery for St Martins's was located in Camden north of Pratt Street . 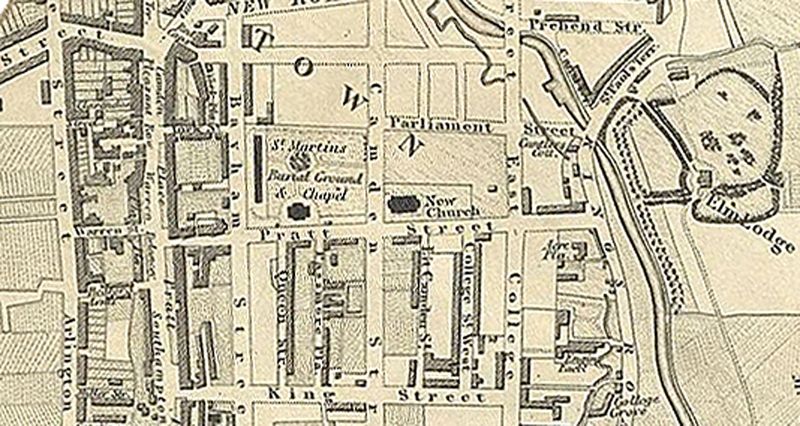 The 1830 map below shows this part of Camden Town with St Martin's Burial Ground and Chapel marked.